This is an area of grassland which is rarely walked upon but very highly visible as the busy Newport to Sandown road goes right past it. Working with our friends at the Green Gym we set about controlling the scrub to improve the amount of light reaching the site; re-planting some mahonia and protecting them from rabbit predation with a wire fence; and also fencing off other small areas to protect the chalk downland vegetation which it is hoped will regrow on the site. In addition, we commissioned the fantastic Hare from an old tree stump. The artist was Paul Sivell (seen with his creation by moonlight here). 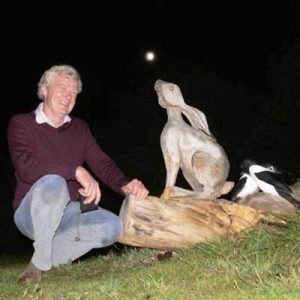 The hare had a bit of a ‘holiday’ in 2009 when it was chainsawed off by a thief, but eventually found its way home and was reattached. We worked with the Parish Council of Arreton to create a biodiversity map, showing all areas of high biodiversity value to ensure their future safety. North of Arreton on the Newport road, Arreton Cross is the wide grassy verge just opposite the turning to Downend. You might not really want to stop to explore the site as most of it is best seen from the road, but if you do want to pay a personal visit to the Hare you can do so. The site is on the Bembridge Trail, between Arreton church and St George’s Down.